August so far has been a month of limited spending in the beauty department. A month of eyeing up new gems from afar whilst I work my way through Boots and Superdrug, ruthlessly letting only the essentials reach my basket. But fear not, payday is looming. Oh yes, that joyous day is here again and I can finally succumb to the temptations of the world of beauty. In preparation for this fine occasion I've been mentally composing a little lust list - or wishlist if that terminology tickles your pickle - to highlight the products that will be going 'straight in my basket'. Fancy a peek? With the true magic that is the Kat Von D makeup range greeting us UK folk in the not so distant future - only 20 sleeps to go ladies and gents - it's only right that one or two of its products gets a feature isn't it? My heart is of course longing to hold an Everlasting Liquid Lipstick as its own and, whilst shade-wise I'm far from fussy, I'm particularly in love with "double dare" and "outlaw". If you're not all clued up on the facts of this product, it applies as a gloss and then dries to a matte-yet-moisturising finish. Claims are that its 24 hour wear can stand food, drink and even (to quote a rather open twitter user) blowjobs. Perhaps too much detail on their part but it definitely doesn't sound too shabby. I'm also crushing on their Tattoo Brow product. You know me, I'm never one to turn down an opportunity to get my hands on a new piece of brow magic and this one is no exception. I know it's received countless raving reviews and I can't wait to give it a test run myself. The next product I'm hoping to nab is the Origins Maskimizer Mask Primer. You can't beat a good face mask and who am I to pass up an opportunity to further reap the benefits of it? Maskimizer is said to help hydrate, soften and optimise skin’s condition so it’s fully prepped to enhance your mask experience. How very snazzy. 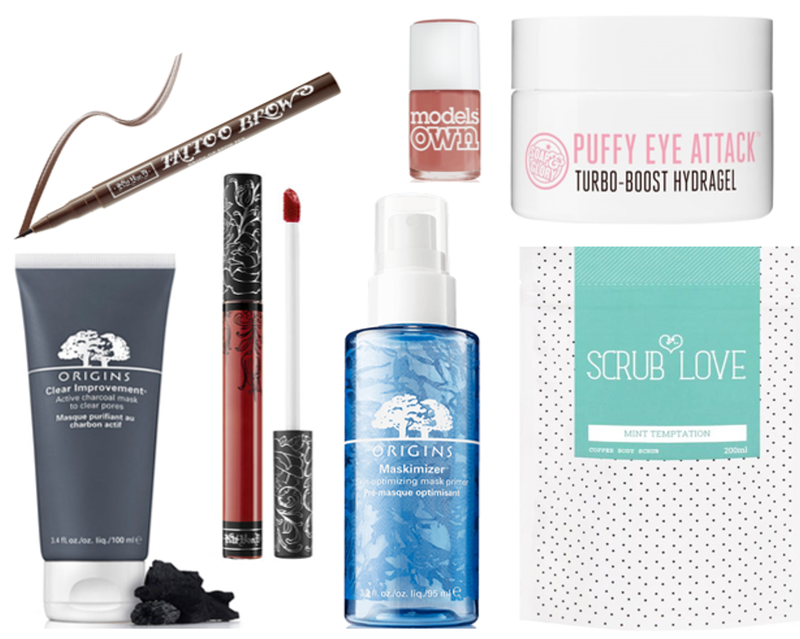 Origins make a second appearance on this list in the form of their Clear Improvement Active Charcoal Mask. I'm a huge fan of the masks the lovely guys at Origins create; last time I tried a new one I wanted to hug it and never let it go. And mention charcoal in regards to a skincare product and I'm sold, so I'm incredibly keen to get my hands on this beauty. I've been on the hunt for a brand spanking new eye cream for a little while now and just recently I've come across the Soap and Glory Puffy Eye Attack Turbo-Boost Hydragel (what a mouthful). For £12.50 it's not too pricy in the market of eye care and seems to fit the bill perfectly for what I'm after. I'd be interested to hear if any of you have tried this little pot of eye goodness? Give me a shout if you have. So we've chatted makeup and skincare, how about nails? As I'm sure you're aware, Models Own launched their Dare to Bare Collection recently and I'm totally crushing on their HyperGel Polish Collection. Nudey nails are totally my thing and Models Own have achieved 5 simply gorgeous shades that I simply can't choose between. They also have a gel-like finish which ticks all the boxes for me. Anyone fancy buying a girl a present? In the bodycare department, I've been eying up the Mint Temptation Coffee Scrub from Scrub Love. I've spotted this brand mentioned here and there in the world of blogging and think it would be the perfect way to satisfy my urge to try a good new body exfoliator. Although Scrub Love offer three different variations on their coffee scrub concoction - 'original lovin', 'coconut affair' and 'mint temptation' - it was the mint one that jumped out at me from my first click on their website due to the anti-bacterial, anti-inflammatory and pore cleansing qualities of the peppermint oil. Is there anything you're craving to add to your dressing table?